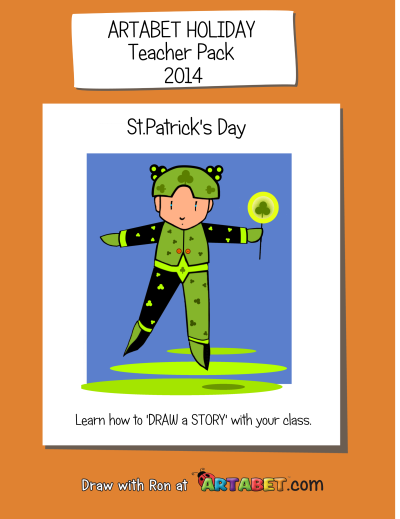 Take a quick look at your student’s or child’s drawing of a person. Ask the ‘obvious’ questions. 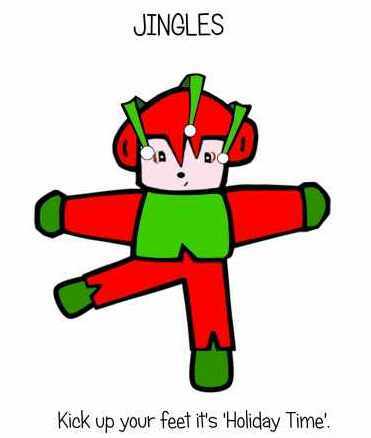 “Are all the parts assembled in the ‘right’ place?” Do the arms come out of the shoulders? Are the arms and legs the ‘right’ length? Is there a neck? Are fingers described? Are facial features described? Is there clothing? 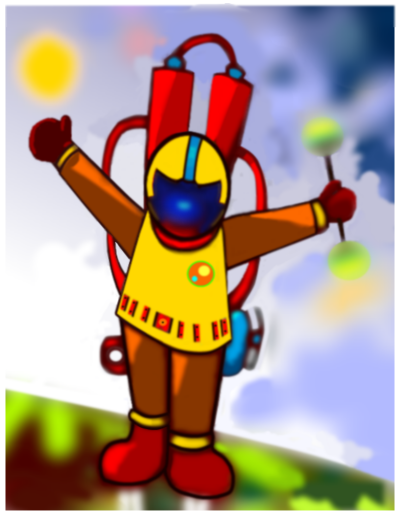 Is the figure doing something such as running,bending,or jumping. How Do YouTo Teach a 5 to 10 Year Old To Draw a Person ? All these questions can have a ‘right’ answer if we approach figure drawing with a basic model. 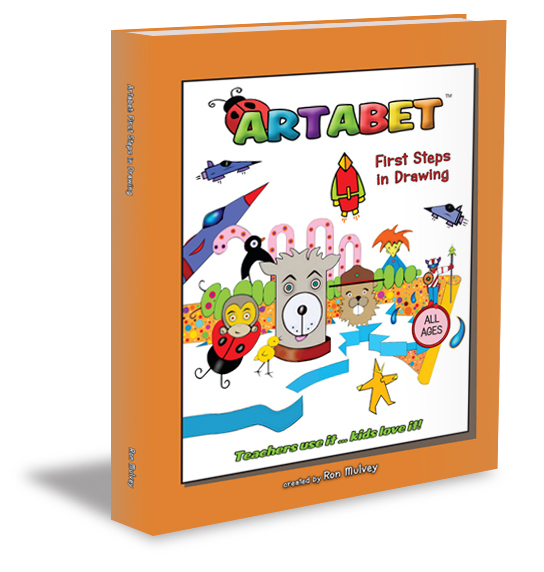 The Artabet model of a person is a perfect introduction for children ages 3 to 7 and it serves well for any age if the student has no previous experience with the drawing of people. I have used it for over 25 years with students and it really works as a stepping stone for creative figure drawing.Let’s take a look at the basic model. 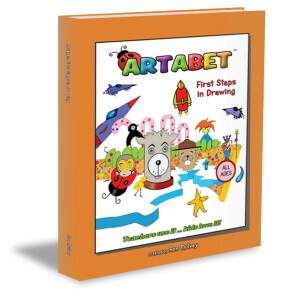 Start with the Basic Artabet Model Person. Now it is time to draw the Artabet Model and add the details that will make it ‘Someone”. 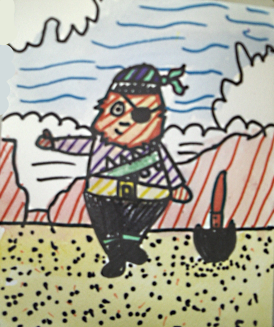 Age 6 drawing using the Artabet Model. 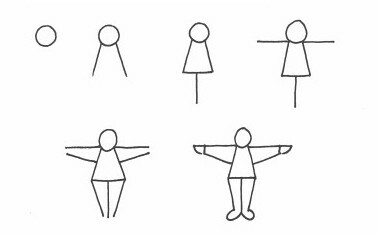 After 10 or 15 practice drawings of the basic Artabet model, you will be ready to teach a 5 to 10-year-old to draw a person standing in what we might call the first position. For the next step – which is to take a step – make a motion – and create a little drama – make your person look like it’s going somewhere. Take a look at the drawing below. 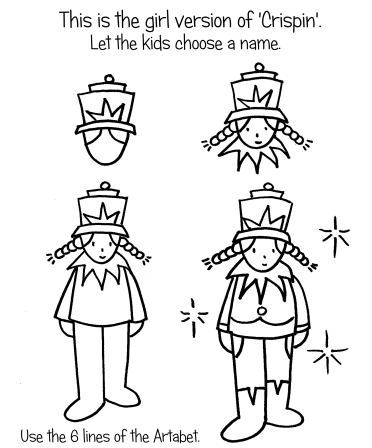 Taken from the Free Thanksgiving Holiday Teacher Pack. One foot is higher than the other, this makes it look like she is stepping forward. The right leg is ‘longer’. 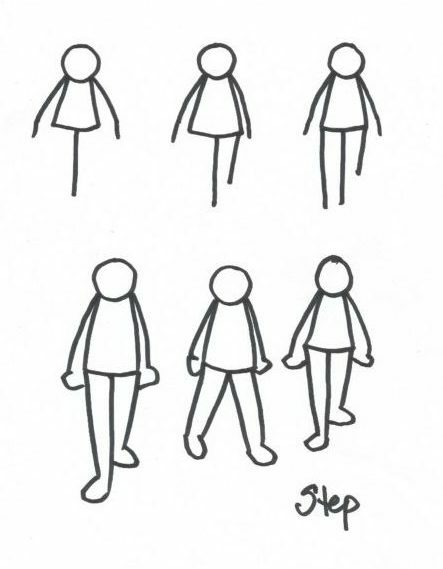 Especially notice that this is achieved by making the center leg line the same as the in the basic model and then making the outside leg line on the left ‘shorter’. It really ‘looks’ like our little person is coming towards us and is not in a static posture as the basic model is presented. 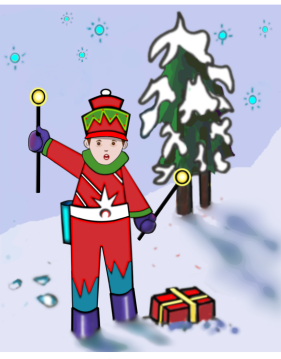 Now, look at JINGLES from the Free Winter Holiday Teacher Pack. Here you have another ‘posture’ or ‘stance’. As you can see the neck is still left out as it is not necessary at this level. Let’s see how far we can take this ‘Little Model’. 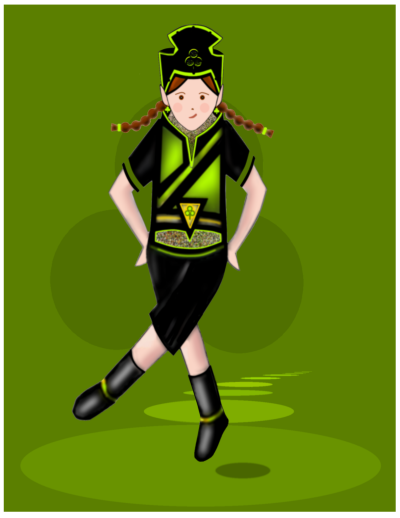 It could be a dancer or a soccer player. Study the rather technical drawing below and draw it a few times trying your best to get the ‘obvious’. Such as the left foot up off the ground. 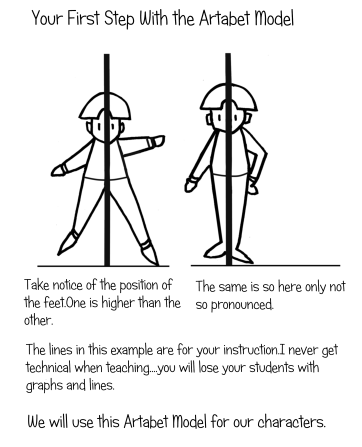 Draw it a few more times without the center line and the horizontal ‘ground line’. 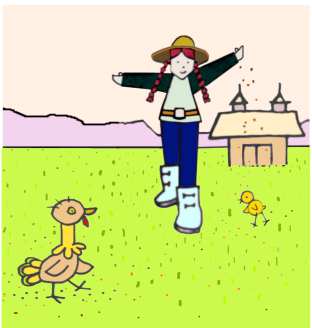 Now scroll down to the next two drawings and see what can be done with this simple drawing of a person. 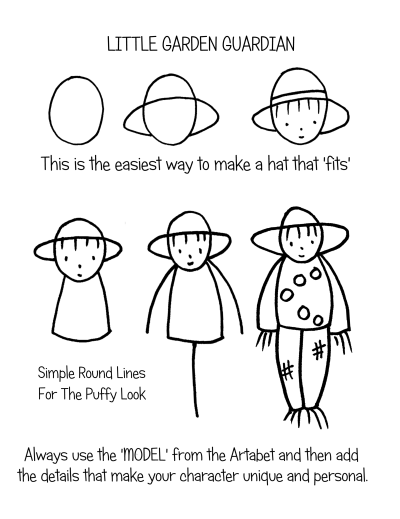 Well, that’s it for HowTo Teach a 5 to 10 Year Old To Draw a Person, hope it works for you as well as it has worked for over 200,000 students over the past 30 years. 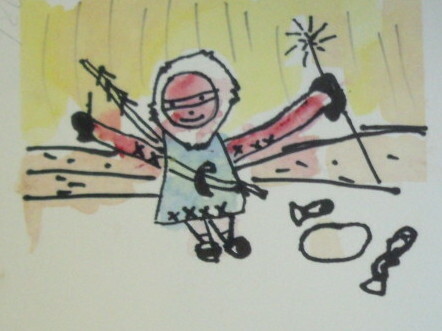 Drawing is really as easy as writing your name. How many times have you written your name? How many times has your 3,5,6,7,8,9, year old written their name? 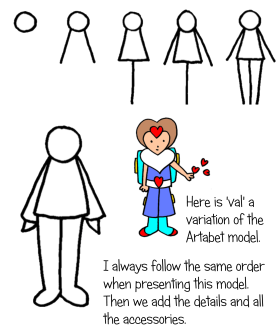 How many times has Ron Mulvey drawn the basic Artabet Model …Ten Thousand Times is Fun! … Repetition Is Our Mission! Be patient and make it fun. It’s all in the Book. And Hi to you also. Any questions I can answer for you? I’m just wowed. So cool! This is genius. I will give this a try. Thanks Leena, It is easy because it is exactly what this age is thinking about and wanting to draw.Let’s keep the childhood of children ‘childlike’. Sounds good, let me know how it turns out Sudeepta. Glad to hear this.We teach our children how to talk and so we also can teach them the basics of drawing. Keep me posted on her progress as I am always here to help where I can.